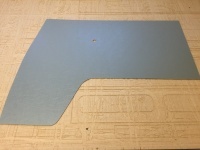 These tough ABS trim panels are the perfect solution for hard working campers. Easy to clean and easy to fit. 100% impervious to moisture so ideal for vehicles fitted with safari windows. 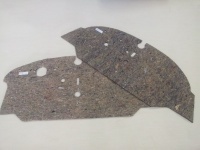 Fit as they come or can also be covered with vinyl or fabric to match your interior. Usually in stock for immediate dispatch. Please select the correct panels for your van. 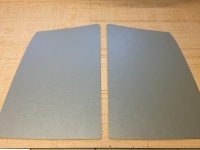 Our Grey Leather Grain ABS front kick panels are a great no nonsense product designed to replace your tired old original VW Split Screen Window trim panels, these are particularly useful if you have Safari windows fitted that may leak a little. 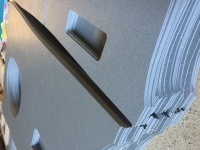 All our ABS and Hardboard panels are precision cut here on our own CNC router to ensure that they match the originals in every way.